The cynical interpretation of the USGA's decision to award the 2015 U.S. Open to Chambers Bay is that this was a money grab designed to prevent the PGA of America from moving in. And what's not to love? It's a muni in the Northwest market where they can structure a favorable contract, erect tents galore and host a concert at the amphitheater currently under construction next to the course. The optimistic take (the only way I read these things) says this is a victory for architecture and USGA course setup man Mike Davis who is trying to shake things up. Chambers Bay is an all-fescue course, meaning the USGA's usual bowling alley corridor concept simply won't happen in 2014. It's also a Robert Trent Jones Jr. design (well, Bruce Charlton and Jay Blasi), marking a break from the stifling litany of Rees Jones renovated courses fueled in part by David Fay and the Executive Committee's lousy eye for architecture. Most of Rees' work severely limits a creative course setup man like Davis. Couple this with deteriorating relationships at Winged Foot and Shinnecock, and Chambers Bay may be ushering in an era of surprising U.S. Open venue selections. Now, if the USGA sells a reality show to NBC where Rees is named the Chambers Bay Open Doctor and we get to sit on conversations between he and Bobby over a Rees-jigging of the course, then we know it's a cash grab. But in the meantime, I like the move and look forward to seeing a new course injected into the rotation. 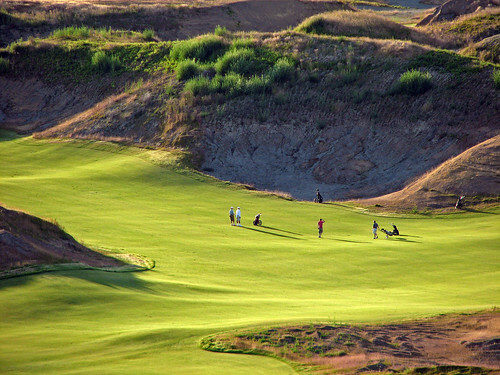 Nothing against Chambers Bay in particular, but I think it's a bad thing -- only because it will make everybody developing a new public course drool unrealistically about hosting a U.S. Open themselves. We don't need architects to create more potential U.S. Open venues. We need the USGA to do something about preserving the ones we've got. He does have a point, no?